NARYN, KYRGYZSTAN — There was frost on the UAZ in the morning when I came outside, but the sun was back to warm things up a bit. Last night I met a group of travelers who were making the crossing into China today. The ancient Silk Road route revived for a modern kind of tourism. Making the crossing was still complicated, though more politically than logistically these days. Tash Rabat, the old caravanserai was still kind of a way point for travelers as it had been when it was constructed — except now the travelers stay in yurts on the outside rather than in the rooms built for them within. After breakfast the China-bound folks went on their way, and I meandered over to the stone fortress-like structure across the valley. With the yurts outside it, it did look a bit like it might have back in the day if a large caravan had come through. I imagined the animals would be out in the field grazing and drinking from the streams, just as the local herds were doing. And the men of the caravan could not all be housed inside the caravanserai. They would probably have set up their tents right here where the yurts were. The only difference would be the activity within the stone compound. Once it was bustling with traders and suppliers for the caravans. A cross between a marketplace and an inn. When I got there the iron gate was locked, and I took the time to make some photos around the outside, figuring eventually someone would come and open it. A woman from the yurt camp arrived soon after me, and she collected my entry fee and unlocked the gate and left me to go ahead and explore on my own. I entered the darkened interior which had been restored but not “decorated” or “lit” so it still had its essentially old character. I could feel like I was uncovering and ancient place rather than going to a museum, and I was glad for that experience. I walked around the chambers and photographed as best I could with just a little bit of light coming from the skylights at the top. They were just small circular windows very high up in the stone that let in a minimal amount of light (and probably also served as chimneys). When I had explored fully, I returned to the outside, climbing up the hill to make some more photos. Not long after a large group of visitors who must have been staying at the yurt camp just below the site lined up at the gate and the woman returned to take their entry fees and let them in. I was glad I had finished my visit before they arrived as the chattering and bustle of activity changed the ambiance of the space from an “archaeological site” into an “attraction.” I left as the sun began warming up the valley and it felt good as I drove between the mountains back towards the road. As I picked up the same tar road I had come in on yesterday, I decided to take my time on the way back to Naryn and stop and explore along the route. It was the opposite pace — a slow, lazy, loping gait. The sun was bright in the sky even if it was cold, and the landscape sprawled out ahead of me, resembling the deserts of the american southwest in places. It was a whole other landscape from the mountainous passes I had been travelling. A more familiar feeling landscape and I took a certain comfort in that familiarity, turning off on a random double track dirt road that seemed to go back towards some sandy colored hills in the distance. I followed it for a while and stopped to make some photos not far from a farmhouse. At some point someone came out of the house (I imagine they were curious about what I was doing there in the middle of nowhere) but they did not approach me and I did not disturb them. I finished my photos and returned to the main road only to repeat the process again a little further along. I was looking for a location I had marked on the map and had a GPS coordinate for, but when I got there it was a small village road that seemed to go to people’s homes. I followed this road for a little while before determining that it was not taking me to any kind of archaeological site, and I again went back to the tar road. My meanderings had me stopping at a cemetery and then a bit further by some interesting sand hills that looked like “my” kind of desert. Just at that moment a man on horseback was heading for the hills and the scene was reminiscent of an old school western cowboy film. I stopped to photograph him and then two younger boys on horseback made their way towards me and posed for photos before taking off to where ever they were going. 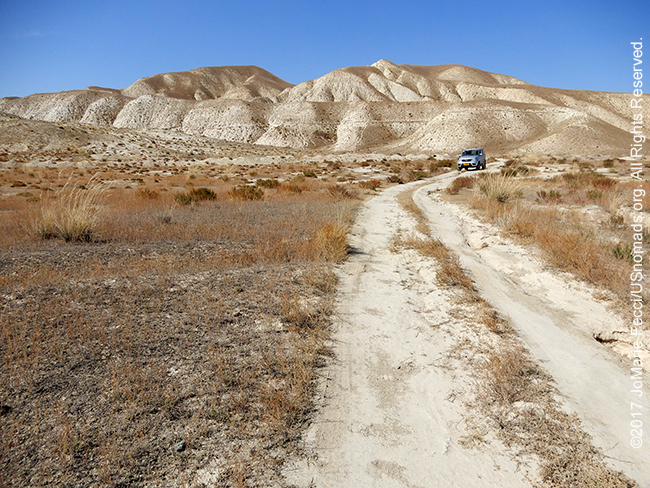 When I put the camera away, I took the UAZ down the dirt path towards the sand hills following the tracks for a while. I am sure they went “somewhere” in the end, but after I while I turned back towards the direction of my route and the town of Naryn.